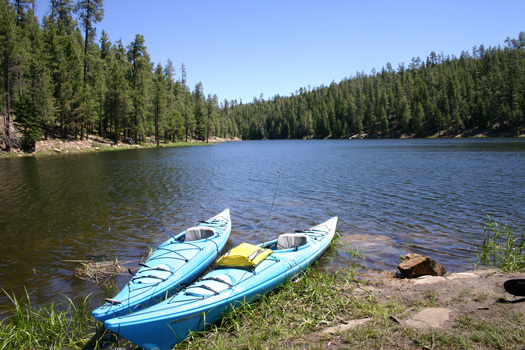 Bear Canyon Lake is one of Arizona's mountain lakes and one of our favorite lakes in the state. It is located on the Mogollon Rim about 40 miles northeast of Payson, Arizona. The lake is situated in the bottom of a canyon at an elevation of about 7500'. There is no vehicular access to the lake. So all persons and boats must come down and then go back up one of the foot trails. This limited access is a key attraction for us even though it means that some effort is required to bring our kayaks and canoes to the water. The lake has never felt crowded to us. Summer time use is popular with scout groups. The lake is over a mile long and is roughly dumbbell shaped. The wind can really blow on the lake, especially through the narrows, making paddling a canoe a chore. The kayaks seem to handle the breezes pretty well. The sides of the lake are pretty steep with trees growing to the water's edge. The upper end of the lake is more gently sloping with a large meadow-like grassy area. A hiking trail of about 3 miles circumnavigates the lake and makes walking parallel to the lake shore pretty easy. We have always done pretty well fishing the lake trolling lures as we paddle. We have seen bait fishermen doing well also. There is a campground on the western rim of Bear Canyon. We camp in the dispersed camping areas near the lake away from the campground.